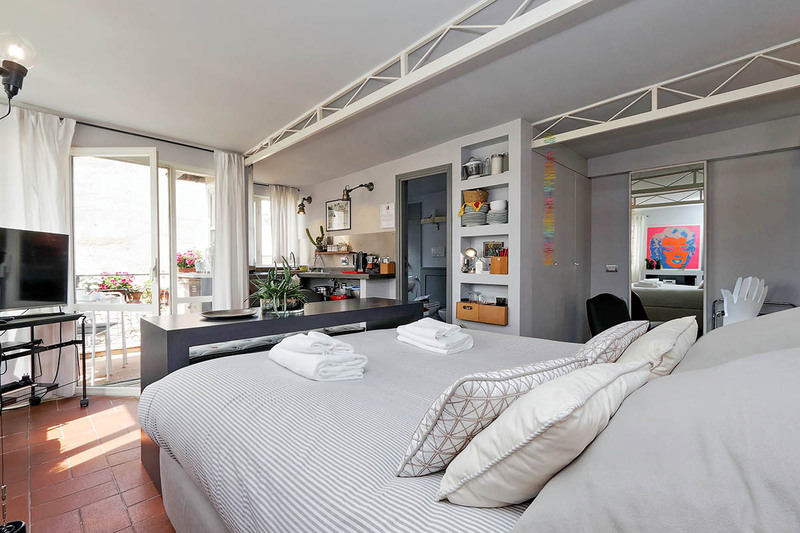 Scala Luxury Terasse studio is perfect! The situation could not be better. This was our second time in the same place, and will not be the last one. Thank You Sibilla and Rome Loft. Sure it's noisy- it's right in the beating heart of Trastevere. Loved the sun-filled studio, the flower-lined balcony, the thoughtful item for every need, the 71 marble steps and the prompt, fastidious service provided by Romelofts. One of the cherished highlights of our trip! Such a nice and homefelt apartment, great location! We couldn't be happier. Just remember to put the bread in a plastic bag or something, there's some tiny ants on the balcony who would love the taste of it. Elegance and taste are what best describe the interior of this apartment. The main room features a beautiful king size bed, with stylish bed-side tables, and elegant night lamps. Some of the amenities include air conditioning, and high speed wireless internet connection. Here you can also unwind after a long day in front of the flat screen TV. This moreover supplies a DVD player, meaning you can enjoy entertainment in your own language, making you feel right at home. In addition to these modern facilities, the apartment has a stylish and elegant design. This means that its interiors create a harmonious blend of modern comfort, with innovative and funky Italian style. 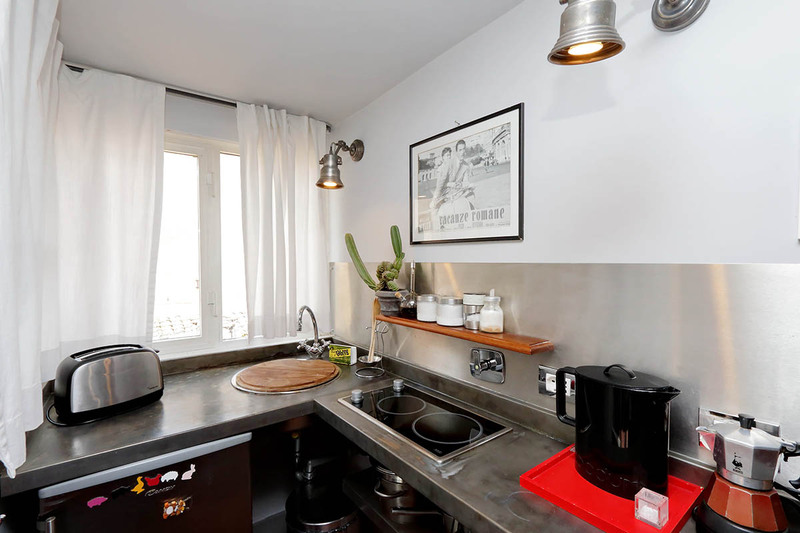 In the corner of the apartment, you will notice a well-equipped kitchenette. Here you will find a gas stove, a sink, and a fridge. 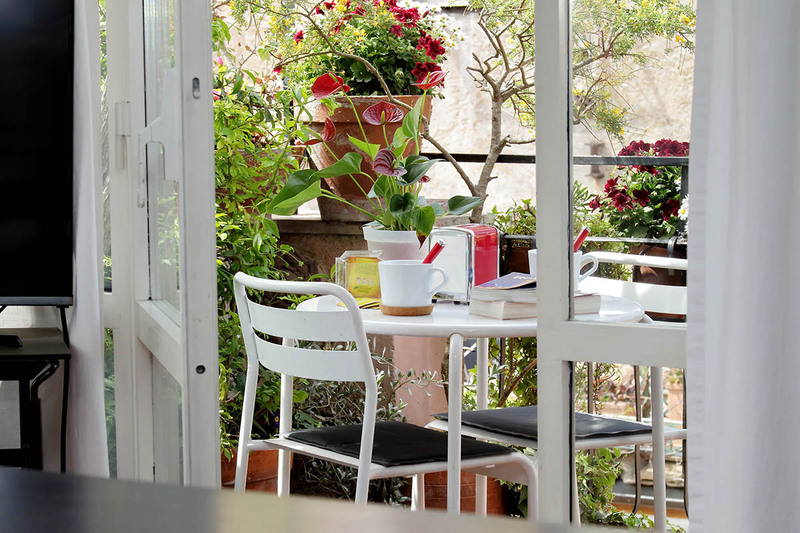 This is perfect for preparing a breakfast which you can then enjoy while sitting out on the terrace. 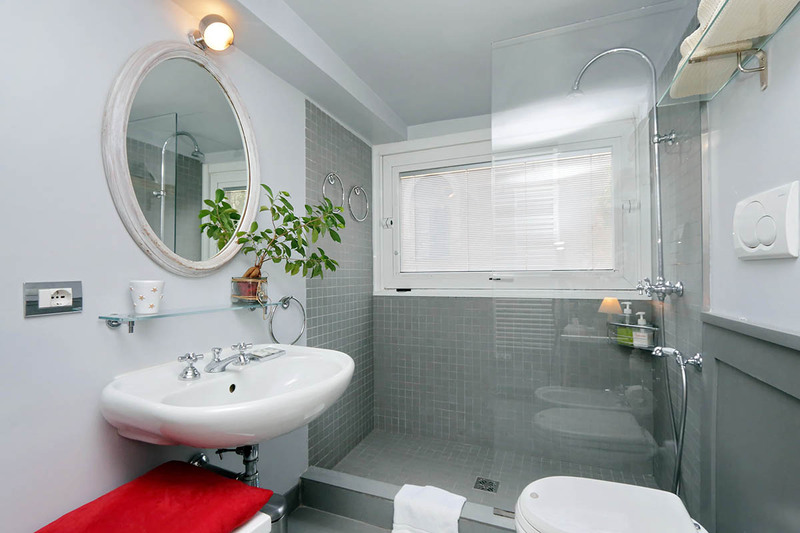 The bathroom is carefully designed with attention to architectural detail. This ensures that the studio apartment feels as spacious as possible. The shower is large and comfortable. It also offers a sunny view from a window in the corner, whilst also maintaining privacy. There is also a baby cot, in case of need. 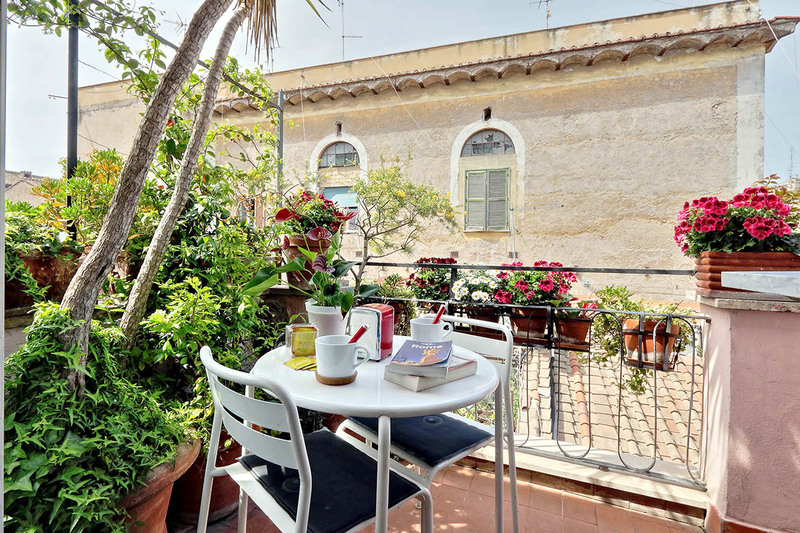 The charming terrace of this Trastevere luxury studio is definitely our favorite part of the apartment. 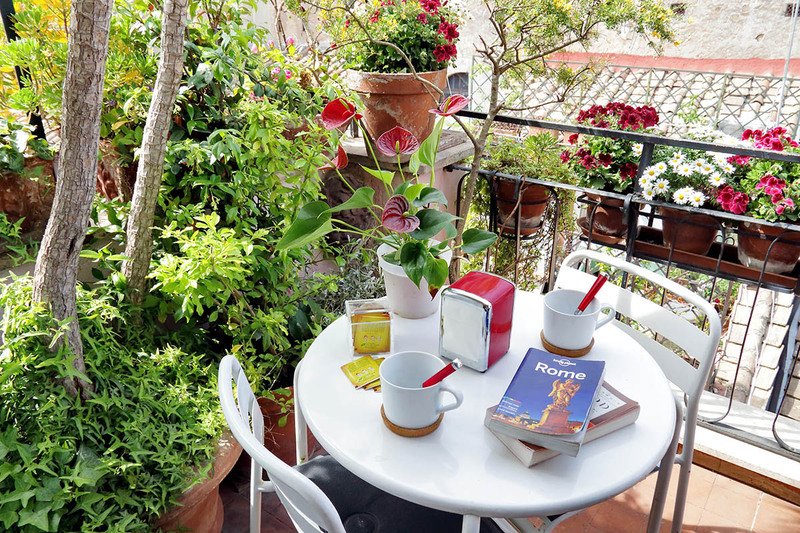 Whether reading a morning newspaper, or just soaking up some evening sun, there is no better place to relax during your Roman holiday! Of course, this is merely the cherry on top of the cake of this apartment. 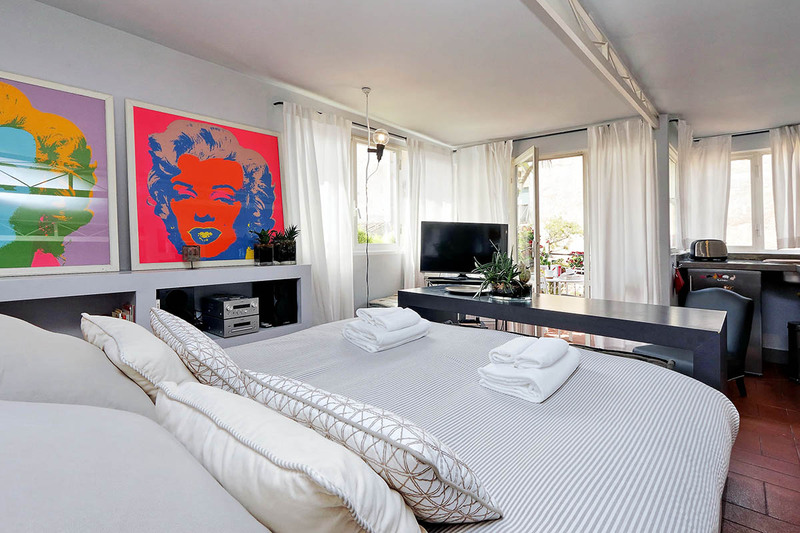 It is truly the ideal place from which to explore the city, whilst enjoying your own privacy. Whether you simply use it to sleep or wish to escape the heat of the day for a while, this apartment will easily be able to cater to all your needs. Trastevere is one of Rome’s most characteristic districts. 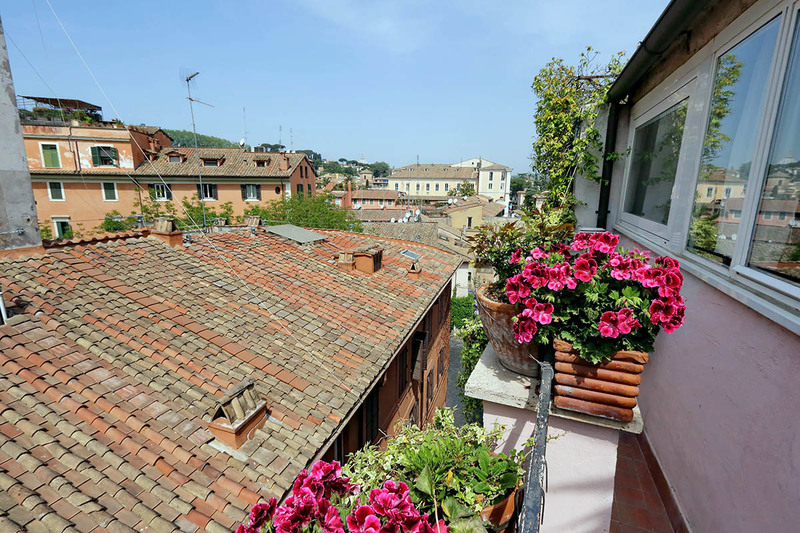 Located just west of the Campo de’ Fiori area, it is much loved by locals and tourists alike. During the day you can pick up some delicious take-away food, or a gelato, and sit in one of its piazzas. Come evening, you can climb the Gianicolo Hill just behind the main area to see a sunset over St Peter’s Basilica. Then head back down into the main area to one of its wine bars or restaurants. 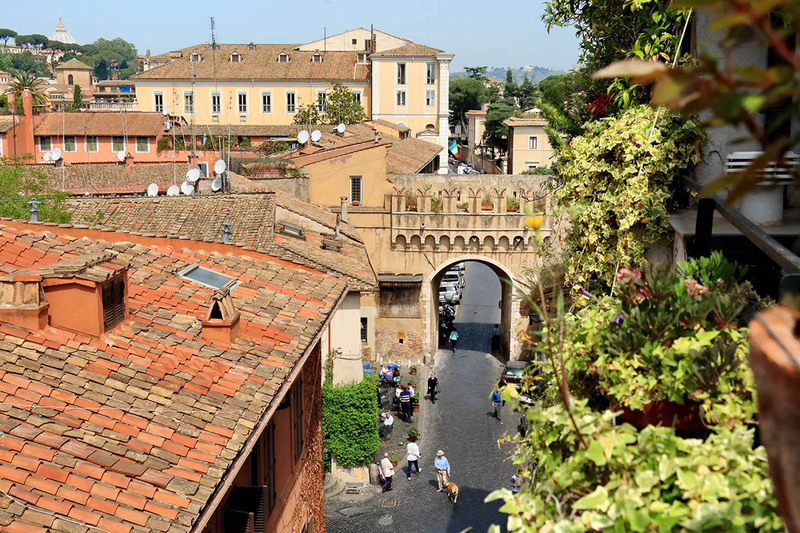 Trastevere is served by a tram stop, but is also within walking distance of many attractions. For instance, the Campo/Navona area is just across the Ponte Sisto, and the Vatican is just 20 minutes walk following the river North. The first of these is a great place to find banks, supermarkets, pharmacies and post offices. The latter is also a great place to find a bite to eat come lunch time. Here you can find some take-out pizza, pasta, salad and noodle bars that both tourists and locals absolutely love! In the evenings, Trastevere is the liveliest and most atmospheric place to be. It attracts crowds of all ages who share a drink with friends or colleagues after work. It is the perfect place to find an aperitivo buffet, or alternatively a restaurant with a classically Roman cuisine. The unit was very clean and nicely decorated. It has great views and nice lighting. The decor was refreshing and modern. The kitchen and bathroom were well appointed and functional. However, although the linens and bedding were of nice quality, the bed itself was way too soft. The mattress itself did not lend well to the thick feather bed on t...Read Moreop. Even with the feather bed removed, the mattress was much too soft. I wanted so bad to love the whole unit because of how cute and nice it was, but the mattress needs an upgrade. The other thing to keep in mind is the 71 stairs leading up to it. We loved the exercise and were rewarded with the bright sunny unit and views, but it may not be good for everyone. Lastly, earplugs are a must as the restaurant below is quite lively until the wee hours. This overall was not an issue for us for the most part. Overall, with a mattress upgrade, we would love to go back. What a fabulous apartment - quirky and bijou yet utterly charming and fully stocked with everything you might need. The array of books on Rome was particularly useful, as was the air conditioning.The bathroom is modern and the shower excellent; so lovely to have such a big window too.Terrace is small but a perfect spot for an al fresco breakfast or...Read More early glass of fizz before heading out to the delights of Trastevere. Even the climb up the stairs was all part of the charm and helped keep us fit and look forward to that terrace even more! Romeloft as a company are super efficient and reliable. From the driver appearing on time at the airport, to the meet and greet at the apartment and everything else, it all went like clockwork and we felt that if anything did need sorting out, they would be able to do it for us.Have recommended Romeloft to several people already and cannot praise you all highly enough. Thank you so much for an amazing stay in Rome for our anniversary! 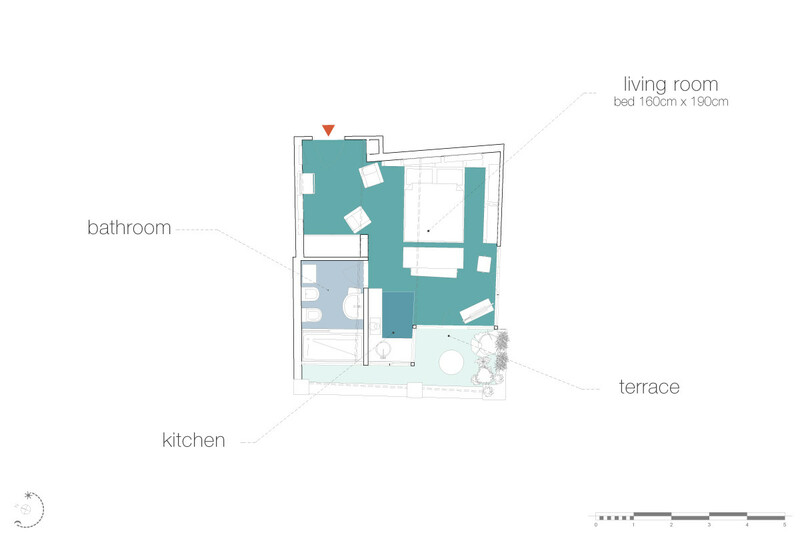 This is a truly lovely apartment - small but very well designed. It has a trendy yet peaceful feel to it. Lovely large bathroom and shower. Bit of a strange, but comfortable, bed - could do with a fitted sheet over the soft mattress topper - and look out for the sign telling you where the sleeping pillows are! Luckily my husband spotted the sign t...Read Moreelling us the pillows were hidden inside the decorative cushions on the bed:) The balcony is small but a great place to sit & look out over the rooftops and view the action in the alley below. Just a warning if you are going to be there over the weekend - and if this is something that bothers you - the noise from the surrounding alleys is rather loud till the wee hours of the morning. You also need to be reasonably fit & able to climb the stairs up to the apartment - but then again - that's what a trip to Italy is all about - lots of walking & stair climbing! Trastevere is definitely the area to stay in Rome - does not feel too touristy - has great bars & restaurants - and is popular with the local people. 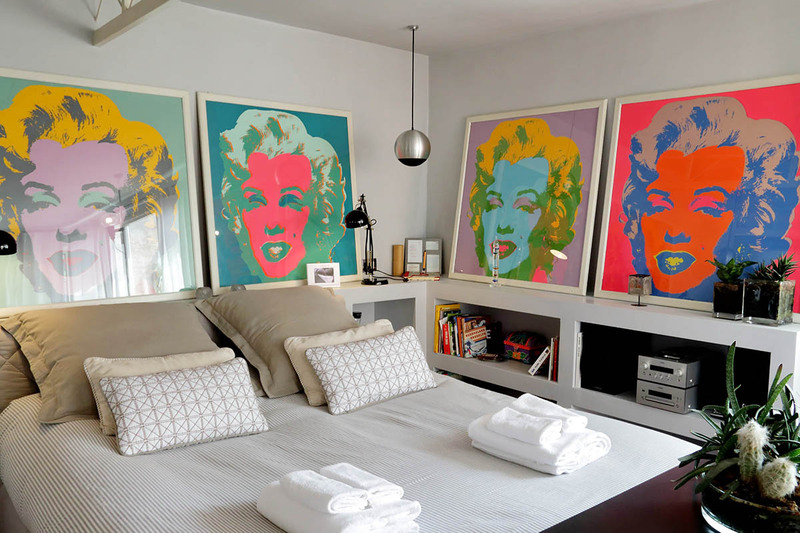 All in all we believe we made the best decision to stay in La Scala luxury terrace apartment in Trastevere! Other guests had clearly enjoyed their time in the loft and their holiday in Rome - this was evident in their comments in the visitors' book. We were more than happy to add our own words of appreciation. The steps were a little daunting at first but we were getting used to them by the end of our stay - and the exercise was good for us. Everyt...Read Morehing was excellent; the balcony was most enjoyable at breakfast time and in the evening. There was quite a lot of noise from the street during the night but it was a nuisance rather than a problem. The toaster remained a mystery to both of us. Everyone we met was friendly and helpful. The city is a wonder: we were able to walk everywhere, with much pleasure. We had such a great time that we were sorry to leave. Thank you. This was a great compact studio flat in a fantastic location. The apartment had everything you could want , bed really comfortable, great shower in the bathroom. The 4 flights of stairs mean you have to be fairly fit but the apartment really is worth it. There's a fantastic view from the small terrace too. We had a fantastic long weekend brea...Read Morek and the Trastavere location is really exciting and buzzing. 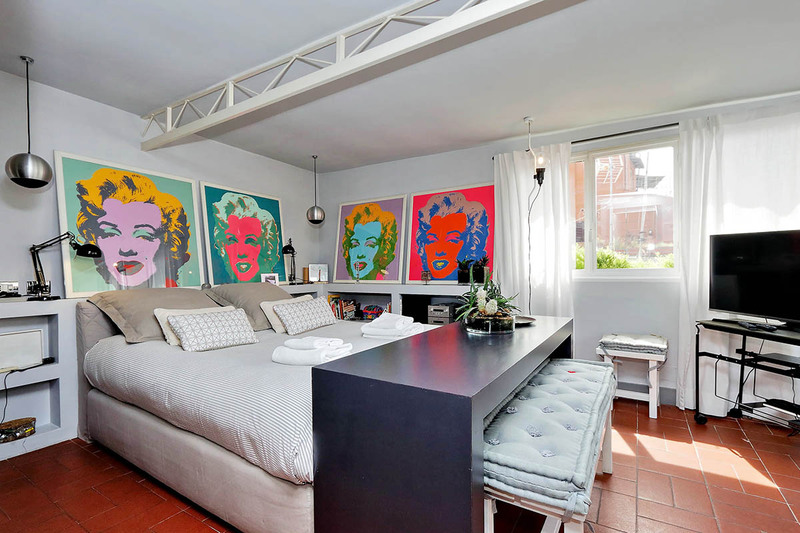 We loved our stay at this studio in Trastevere. The location was absolutely perfect and the balcony was definitely the highlight. It gets amazing evening sunlight! The studio was perfectly clean and comfortable with good AC, which was really important for our mid-August stay. Great shower (although the drain was a bit clogged) and comfortable bed. ...Read MoreOur only complaint (and this wouldn't prevent us from recommending the apartment) is that there was a lot of knick-knacky type stuff around (bowls, candles, picture frames, etc.) It's very well furnished with everything you could need, but a few less knick-knacks would make it easier to find places to put your own things (particularly in the bathroom). Honestly though, this was a fantastic stay and we've already recommended it to friends! From start to finish, everything was seamless, We ordered a car to pick us up and it was ready and waiting, brought us right to our apartment were we met Nissar, Nissar took our bag, showed us around the apartment and was eager to make sure we were happy and comfortable. Nissar explained everything well and advised if we needed anything to just ca...Read Morell. The room was compact, Wifi was good and the bed was super comfy, just want you needed after a long day exploring. I would recommend this room and Romeloft to friends. The apartment was lovely, bright and nicely designed. The small terrace, with a great view, makes it truly excellent. The location was very convenient, but the most immediate neighborhood attracts a young noisy crowd at night. There were some problems with the Internet connection and the shower drain was slow. Fortunately, neither became major prob...Read Morelems while I was there, but these problems need to be fixed. I can recommend the services of Rome Loft, and I can recommend this apartment for people who do not mind a bit of street noise at night. I chose to visit in November when the weather would not be too hot and made the right decision! The apartment had everything I needed and the lovely warm and spacious bathroom was a bonus. The only disappointment was the WiFi which did not work for 24 hours but after a text message to HQ this was fixed. Thank you for this apartment. Me and my wife were truly pleased with the whole experiment with the Romeloft. The apartment was everything promised to be and so was the service provided by Romeloft. We will definitely use Romeloft's services again. Thank you for renting the apartment to us, We couldn't have asked for a more perfect holiday in Rome. The apartment was perfect and so clean. We really enjoyed it. Your assistant was very nice and helpful. I would give it 5 stars. The Bed was very comfortable. The apartment had everything that we needed and smelled great. Thank you. 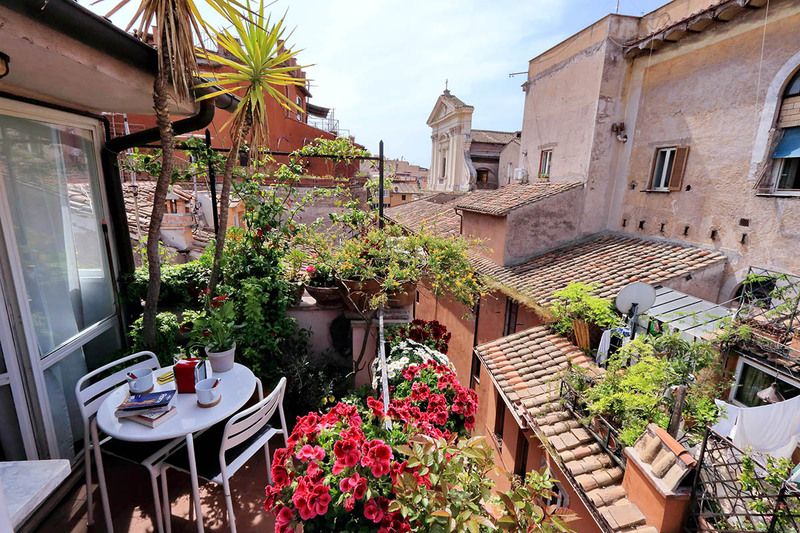 We had an amazing time at this flat in the heart of Trastevere. It was a real pleasure to get back home after a long day out visiting Rome. The flat is definitely not small for a couple. We found it very comfortable and disposed in a very clever way. We loved it! We loved this apartment. It is small but very comfortable. It is also very well equipped for self-catering. The balcony is lovely for an early morning coffee or a glass of wine at dusk. However, the area is so full of restaurants and pubs that you won't be spending all that much time there. The apartment is within walking distance of most site...Read Mores. We did not use public transport once. Climbing the stairs to the fourth floor after a day of walking around Rome may be a bit intimidating, but worth it. The apartment is just perfect for two, the bed was unbelievably comfortable with lovely quality bedding, the bathroom was a great size with a big shower and room for two, there was a fab tiny coffee maker for espressos on the leafy terrace up above the lively hubbub of Trastevere - the views over the rooftops towards the Vatican were a treat. 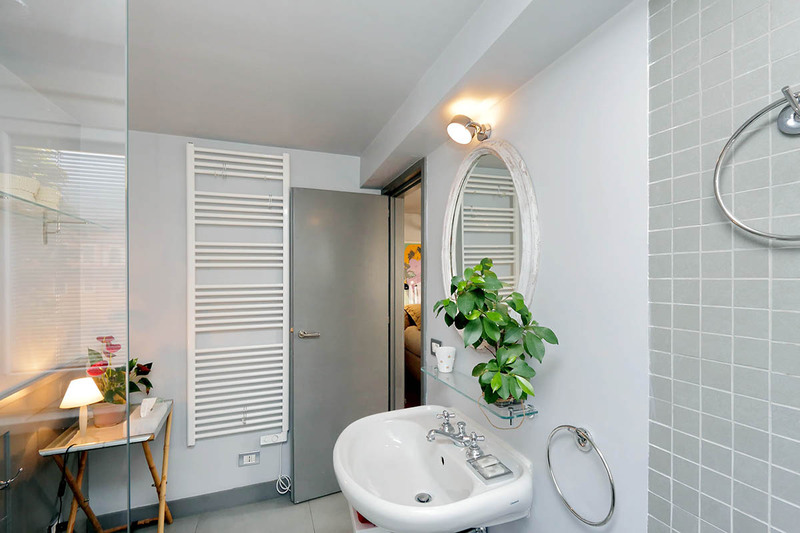 We we...Read Morere impressed with the level of thought that had gone into this apartment which although undeniably compact, worked so well, you do need to be tidy however especially in the kitchen area or you run out of space rapidly! We liked the decent lighting and romantic candles; large wardrobe and dressing area with huge full size mirror; comfy white bathrobes; really effective heated towel rail; books, ipod dock, surround sound tv (those round things that look like lights are actually speakers!) The location was amazing with all we needed on our doorstep or within walking distance - the streets really come alive at night (even in November!) there was an amazing grocers around the corner towards Piazza Trilussa with at least 20 varieties of tomatoes, a treasure trove of egyptian glass in a little shop on Via della Scala and the wonderful Glass Osteria where we celebrated my 50th birthday is literally stumbling distance. And finally Mr Honey was lovely, so helpful and friendly (and carried our biggest suitcase all the way up to the 4th floor for us!) We used the luggage storage facility on our last day which was really useful. We will definitely be returning! The location of this loft is excellent. We had easy access to all major sightseeing locations in Rome. There is also a taxi stand around the corner at Ponte Sisto that gets you to where you want to be in no time and for cheap. Excellent restaurants were all around us and across the Tiber river. Traffic is minor in this quarter. The only getting use...Read Mored to was tourists eating and partying past midnight into the early morning. We ended up joining them as the days went on. The loft was very clean and the set up was comfortable and well laid out. The unit has Wifi that worked very well. Communication with M Honey and his staff was easy at first, but then he did not respond later. I would definitely use Romloft and this unit again when in Rome. Thanks for a wonderful stay. The apartment was just as described yet better than expected! 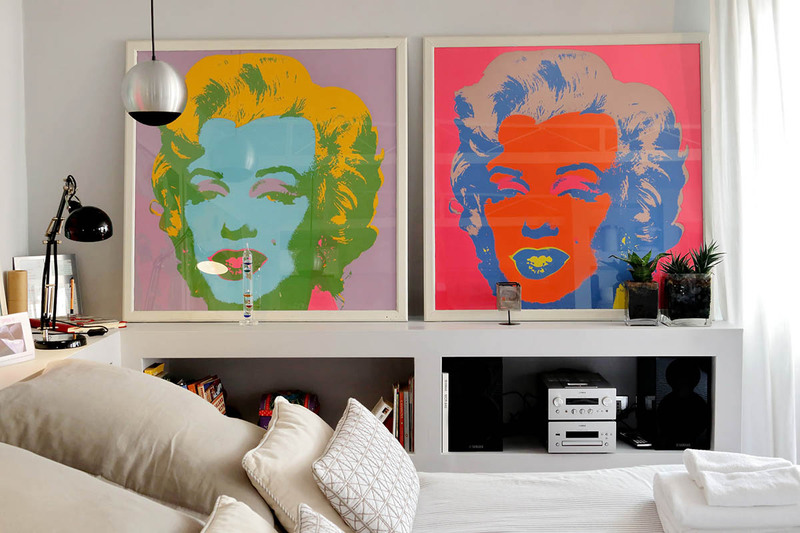 Clean and tidy yet with quirky, eclectic character and style. The location was superb. I purchased a 3 day bus pass prior to arrival and we didn't use it! You can easily walk to vatican, colosseum, Spanish steps in 15-20 minutes and there are so many cafés and sites en route, the w...Read Morealk is part of the attraction. 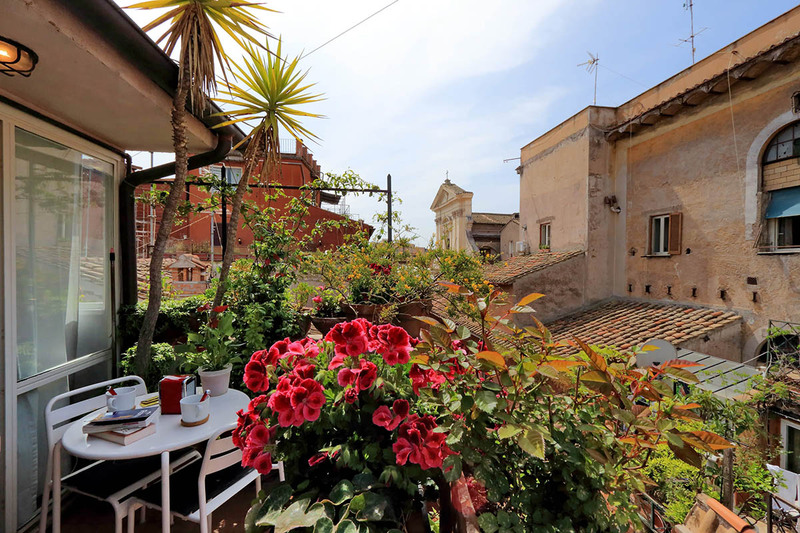 Trastevere is fantastic as a place to stay, and the apartment is situated very centrally. The night life buzzes but is chilled and low-key. Rome Loft were excellent and efficient. No problems with service. To top off the amazing week in Rome, my boyfriend proposed in the very same apartment! What more can I say? We loved the Scala luxury terrace studio! It had a very comfortable bed, was very well equipped & clean! The wonderful little terrace was perfect for wine at sunset or coffee in the morning. The view of the skyline was beautiful! The only thing to consider is that it's located on the 5th floor with no elevator so keep that in mind if yo...Read Moreu have any mobility problems. Ciao everyone at Romeloft! We had such a wonderful stay at our cozy place in Trastevere. 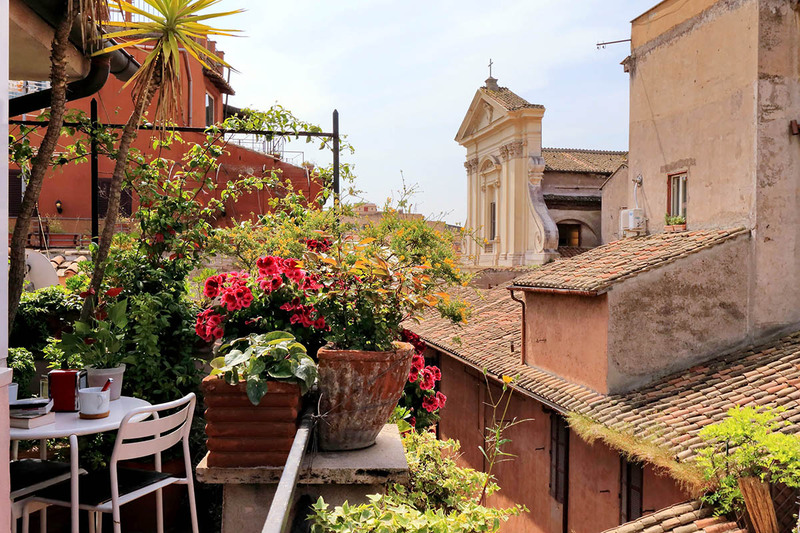 We both love Rome so much and it was a delight to have our own home with cute balcony where we could sit out in the evening and sip wine. Everything in the unit was perfect. Thanks! Stayed in the apartment for 3 nights at the beginning of October. We were arranged the airport transfer to collect us at airport and although it was a little bit more expensive than jumping in a cab it was definitely worth the extra expense. We were met outside the apartment as soon as we arrived which was an hour earlier than check in and the k...Read Moreey handover was thorough and expedient. The apartment... Well, I cannot sing its praises highly enough. It was immaculately clean and an incredibly well thought out space. The bed was one of the most comfortable I have ever slept in ? and everything you could possibly want was on hand. My favourite item was the little espresso maker and Coffee for a morning caffeine jolt, we had breakfast most mornings on the terrace over looking St Peter's Basilica. The only negative was that it was on the top floor which meant lots of steps. Not a problem for us as we are young and fit, but be prepared. Would stay there again without hesitation ? Stayed here for my birthday weekend. 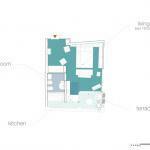 Lovely flat, great location and close to all the things we needed. Twenty minute walk into the centre of Rome, 1 minute to the best pizza restaurant (Dar Poeta) and a huge choice of great bars and restaurants on your door step. Transfers were only 7 euros more than an ordinary cab and well worth it. Key pick up ...Read Morewas seamless and Mr Honey was really helpfull. Would reccommend if you want to be in the centre of what's happening at night, but it can get a little noisy if you wanted a really quiet stay. We thought it was perfect! It was my second stay in that very bright, central, cosy apartement : a real lovenest ! I could only recommend it warmly. Lots of restaurants (Da Vittorio, Z'imberto, la Taverna della Scala)and cafés in the neighborhood. Mathilde. Transfer from airport and meeting with Honey...seamless. Apartment was everything we expected and more.....GREAT location, comfy and well equipped. Would absolutely use RomeLoft again...we will be back. We stayed 2 weeks in April and had a wonderful time. The flat had everything we needed, and we were right in the middle of Trastevere. You have to have good and sturdy legs, for the walk to 4th floor is steep and hot, but then you're rewarded with a nice terrace with lots of flowers and a lovely view. The agency was very fast and helpful when ...Read Morethe WIFI broke down, and the tranfer to and from the airport and the meeting with the key-manager was very punctual. We'll be back next time we go to Rome! We stayed six nights in this lovely studio and we enjoyed every minute of it.Small but comfortable with chic details, big bathroom, comfortable bed and a wonderful little terrace. The location was perfect, with shops, cafés and resturants just outside the doorstep. We had problems with the hot water someting that was taken care of immediately. Air...Read Moreport transfer was very comfortable and exactly on time. We had a fantastic time - our apartment was lovely and the location felt really safe with a great buzz in the evening. Local shops and amenities on our doorstep accompanied by friendly locals. We hired bikes and that was by far the best - in fact only - way to really see and feel Rome. I would recommend the apartment and company to anyone visiting ...Read Moreand it was by far our favourite city break to date. We really enjoyed our stay in this apartment. It is lovely inside with lots of chic modern touches. The kitchen is well-equipped and we cooked a full meal there. The terrace is a real bonus and we sat out enjoying a glass of wine until the early hours. We explored the whole of Rome from the apartment on foot so it's in a great location. Sibill...Read Morea from Romeloft came to meet us to give us the keys. She was on time and lovely and friendly. She showed us how to use everything in the apartment and was really helpful in directing us to trains and a supermarket. We really enjoyed our stay in Rome and will definitely use Romeloft again on our next visit. Just wanted to say that our stay was fantastic! The automatic moka, super comfy bed, amazing shower and terrace really made our stay. The Trastevere is a fantastic area too!! Just down the street try Ristorante La Scala for an amazing dinner and Ristocampo for the most delicious panini! !